If Sergio Leone — the creative mind behind spaghetti Westerns such as “A Fistful of Dollars” and “The Good, the Bad and the Ugly” — had ever directed a slasher movie, I suppose it would have looked a lot like Doomtown. Imagine an Old West town, populated by ghostly cowboys, headless horsemen and dust-covered zombies, all of them swaggering about at an unhurried pace, sizing up at interlopers and ignoring open wounds. The unspoken dilemma of these undead, uninhibited townsfolk seems to be this: Should I make this kid cry or not? 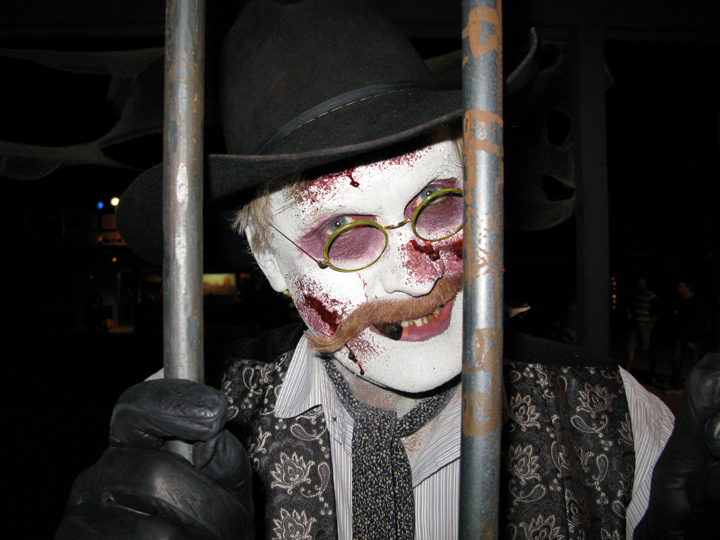 Doomtown is the annual October incarnation of Rawhide Western Town at Wild Horse Pass. 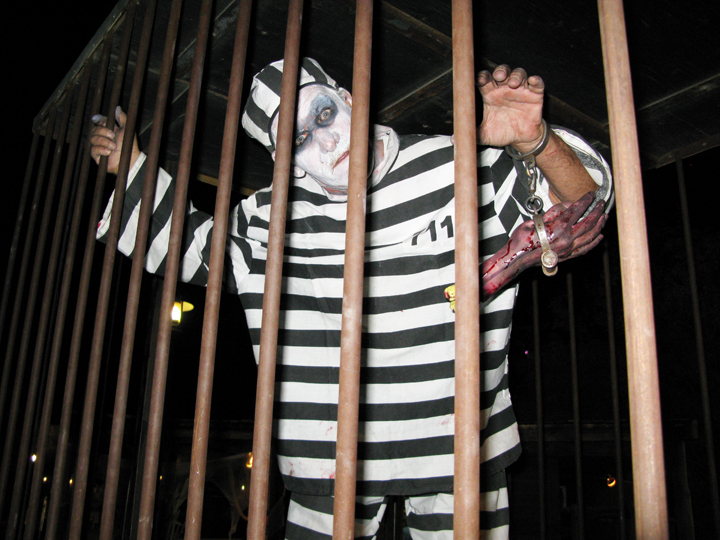 In the spirit of Halloween, the purveyors and performers at this replica of an 1880s Arizona boomtown don ghoulish garb and paint the town red, white and bluish — with fake blood, spider webs and black lights. I love Halloween but don’t scare particularly easily, so I carried a healthy bit of skepticism into last night’s sneak peek of Doomtown for media members. But I was instantly encouraged to see a pre-teen girl clutching her mother’s had and crying, “I want to go home!” as a headless horseman and pistol-waving cowboy circled her family aboard inky-black steeds. This could be good, I thought. And it was. Crying child aside, I can confidently report that Doomtown is fun for the whole family. The degree to which you frighten yourself is entirely up to you. Our cadre of Doomtown expeditionaries consisted of five media/PR types and one very cool 11-year-old boy. The latter’s emotions vacillated from (1) pretending not to be scared, (2) pretending not to be scared while laughing loudly, (3) being scared without pretense, (4) being absolutely terrified as a chain-saw-wielding zombie chased him out of a haunted house. We adults lubricated our fearlessness with salt-rimmed beverages and whiskey cocktails — neither of which, by the way, I would recommend taking on the Train of Terror unless you want to disembark with wet clothes. The 12-minute ride aboard this miniature train (whose conductor looked as though he were the illegitimate spawn of Bea Arthur and Ozzy Osbourne) was my favorite Doomtown attraction. It was dark, creaky and full of surprises — everything Halloween should be. 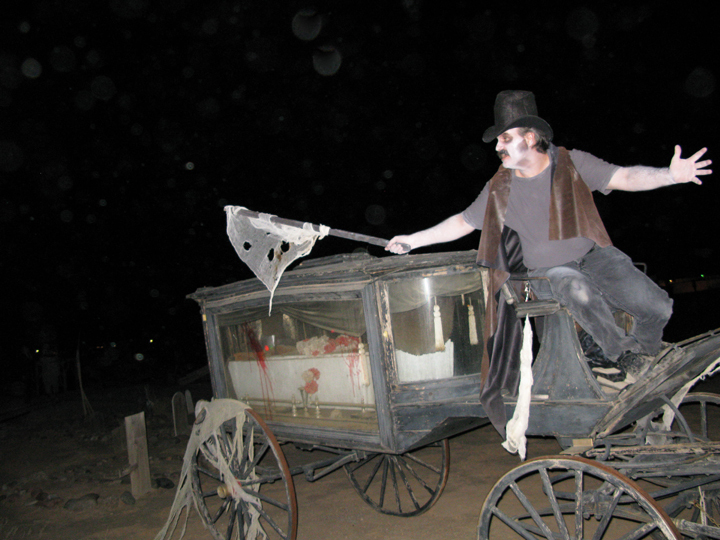 You can scare up a ticket to Doomtown for $13, but I suggest forking out $24 for the combo pass, which gets you into all the attractions (including the Train of Terror and the Rawhide Roughriders stunt show) as well as two haunted houses (the Asylum and Crypt). For more information about Doomtown, including hours, pricing and directions, visit Rawhide’s Web site at www.rawhide.com. The event runs through Nov.1.